A lighthouse is a tower that emits a flashing beam of light from a system of lamps and lenses. They mark dangerous coastlines, shoals, or reefs, and guide pilots at sea into safe harbors. In the 19th century, they were vital lifelines to maintaining safety at sea. Built in 1700; aided mariners for 162 years. 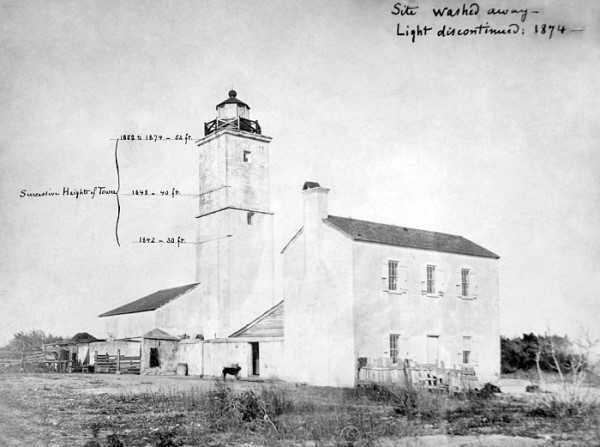 Image shows the various stages of the lighthouse structure. Don Juan Ponce de Leon discovered La Florida, the Land of Flowers, in 1513. Approximately fifty years later, Spain attempted to colonize Florida by dispatching Don Pedro Menendez de Aviles to the area. Menendez arrived off the Florida coast in 1565 and established the fledgling colony of St. Augustine, the oldest permanent European settlement in North America. Near St. Augustine, the Matanzas River flows past barrier islands named Anastasia and Conch and empties into the Atlantic Ocean.